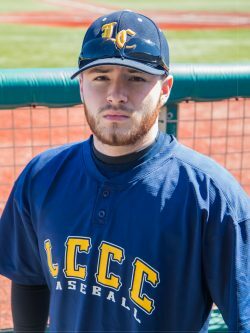 The LCCC Men’s Baseball team got a couple of big road wins today (4/16) over Penn State New Kensington, winning game one 12-4 and the nightcap 13-2. Both pitchers threw complete games for the Commodores and with the victories, LCCC improves to 9-15 on the season. Jared Naida (Cleveland/Lakewood) was brilliant from the bump in game one, allowing no earned runs and improving upon his 0.75 ERA, which currently ranks him second nationally in the NJCAA. Damion Coleman (Niles/Niles McKinley) went 3 for 4 with a homerun and two RBI’s; Anthony Lavisky (pictured; Avon Lake/St. Edward) was 2 for 3 with 3 RBI’s, and Eli Henderson (Toledo/Whitmer) was 3 for 5 to lead the offense. 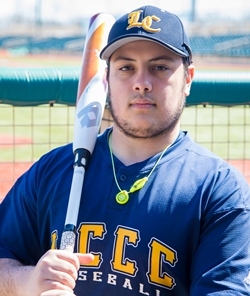 LCCC Men’s Baseball team squared off today (4/10/19) against Eastern Gateway Community College with some late-inning firepower helping the Gators to a 13-3 victory over the Commodores. Damion Coleman (Niles/Niles McKinley) and Eli Loveland (pictured; Toledo/Toledo Whitmer) both had homers for the Commodores and Jesse Barrios (Wooster/Home School) was once again Mr. Consistent…going 2 for 4, with a double and an RBI in the loss. 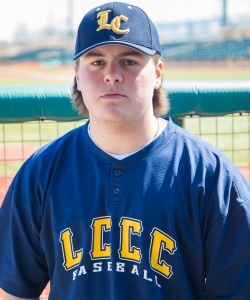 When you are a Division III school, it can often be a challenge to square off against a Division II opponent, as the LCCC Men’s Baseball team learned yesterday (4/8/19) in their losses to Edison State. Both games went just 5 innings with Edison State coming out on top by scores of 24-7 and 17-0. 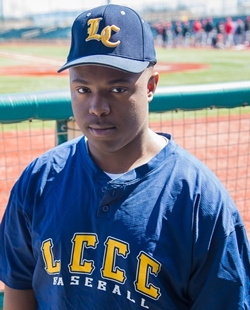 A bright spot for LCCC came in the bottom of the 4th when Damion Coleman (pictured; Niles/Niles McKinley) hit a 3-run dinger for the Commodores. 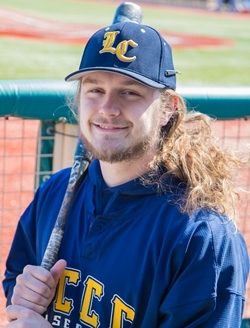 Although the Lorain County Community College Baseball team went 1-3 this weekend, their record could just have easily been 3-1 against some very tough competition. Highlighting the weekend play was a thrilling 10-inning come from behind win over previously unbeaten OSU Mansfield in game one, giving the Commodores a 9-8 win. Domenic Fleming (Columbia Station/Midview) went the distance for the Commodores, pitching all 10-innings for the win and giving up only 3 earned runs, while notching 6 strikeouts. The Lorain County Community College Men’s Baseball team had a tough road-trip to PA over the last two days, as they lost to CCAC South, a team they beat twice earlier this season, then fell just short in competitive games against CCAC Boyce. 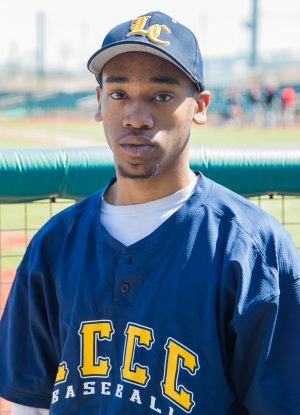 D’aunte Bowens (Oberlin), was on the mound for the Commodores in game 2 against CCAC Boyce and pitched very well, notching 6 strikeouts, but LCCC couldn’t score enough runs to give him the win. 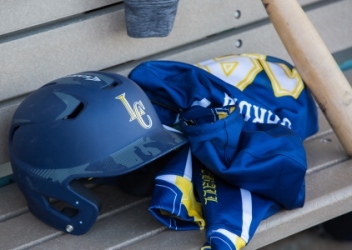 The LCCC Men’s Baseball team battled hard against Region XII Division III rival, Owens Community College, but lost both ends of the double-header, by scores of 6-4 and 5-0, on Wednesday (3/27/19). Despite the 5-0 loss in game two, it proved to be an incredible pitcher’s duel right up until the top of the 7th, as Jared Naida (pictured; Cleveland/Lakewood) brought the goods. Naida pitched a complete game, striking out 9 batters and allowing only 1 earned run. 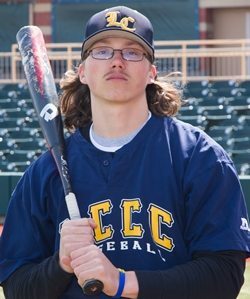 The LCCC Men’s Baseball team took both games on Saturday, 3/23, in a double-header against Washtenaw Community College at Sprenger Stadium. Both games went five innings with LCCC taking the first game 20-4 and the finale 17-3. Leading the game one offensive blast was Jared Naida (Cleveland/Lakewood) going 3 for 4 with a grand slam and 6 RBI’s. Domenic Fleming (Columbia Station/Midview) and Jared Naida (Cleveland/Lakewood) pitched complete games to lead the Lorain County Community College Baseball team to two wins today against visiting Butler County CC. Noah Henderson (pictured; Toledo/Whitmer) was 2 for 3 with 2 runs scored in Game 1 and 3 for 4 with 2 doubles Game 2. 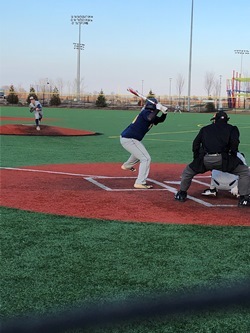 The Lorain County Community College Men’s Baseball team dropped both games today (3/18/19) in a doubleheader against Schoolcraft College, after giving up early leads to the team from up North. The Ocelots took game one 18-9 and game two 9-3. The losses drop LCCC to 2-3 on the year.